The Prime Minister, Shri Narendra Modi, the President, European Council, Mr. Donald Franciszek Tusk and the President, European Commission, Mr. Jean-Claude Juncker at the joint press statement, at Hyderabad House, in New Delhi on October 06, 2017. New Delhi: 1. The 14th annual Summit between India and the European Union (EU) was held in New Delhi on 6 October 2017. The Republic of India was represented by Prime Minister Shri Narendra Modi. The EU was represented by Mr. Donald Tusk, President of the European Council, and Mr. Jean Claude Juncker, President of the European Commission. 2. The leaders reviewed the wide-ranging cooperation under the India-EU Strategic Partnership. 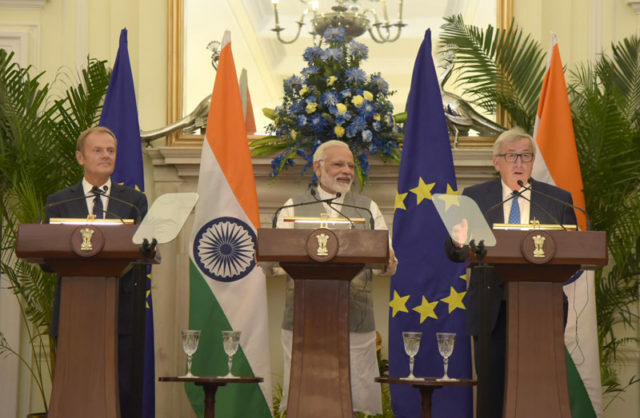 Recognising that India and the EU are natural partners, the leaders reaffirmed their commitment to further deepen and strengthen the India-EU Strategic Partnership based on shared principles and values of democracy, freedom, rule of law and respect for human rights and territorial integrity of States. 3. The leaders expressed satisfaction at the progress made towards implementing the India-EU Agenda for Action 2020 – the roadmap for bilateral cooperation endorsed during the 13th India-EU Summit. 4. The leaders committed to work in a result-oriented and mutually beneficial manner to further strengthen the India-EU Strategic Partnership by deepening their trade cooperation, enhancing investment flows in both directions and broadening dialogue and engagement on global and regional issues, including climate change, as well as migration and the refugee crisis, and resolved to further strengthen their bilateral and multilateral cooperation in these areas. 5. The leaders commended the strong engagement of the European Investment Bank in India in a wide range of key sectors, in particular in the field of climate action and renewable energy. 6. The leaders underlined the importance of regular high level contacts to enhance India-EU co-operation and mutual understanding. They noted the fruitful outcome of the India-EU Foreign Ministerial Meeting in New Delhi on 21 April 2017. Foreign Policy and Security Cooperation – Partners for Security. 7. They agreed that India and the EU, as the world’s largest democracies, share a desire to work closely together and with all relevant players to support a rules-based international order that upholds agreed international norms, global peace and stability, and encourages inclusive growth and sustainable development in all parts of the inter-connected and multipolar world. They welcomed the growing convergence on contemporary global issues and agreed to enhance India-EU cooperation in all multilateral fora. They also recognised their common responsibility towards ensuring international peace and security, and an open and inclusive international order. 8. The leaders confirmed their commitment towards conflict prevention and sustaining peace as fundamental aspects of promoting security and prosperity, fostering non-proliferation and disarmament, and agreed on the need for the global community to unite to address the menace of terrorism and safeguard the security of the global commons – sea lanes, cyber space and outer space. They welcomed the 5th India-EU Foreign Policy and Security Consultations held in New Delhi on 25 August 2017 – a platform to further deepen cooperation in the political and security area. 9. The leaders reaffirmed their commitment to an open, free, secure, stable, peaceful and accessible cyberspace, enabling economic growth and innovation. In particular, the leaders reaffirmed that International Law is applicable in cyberspace, and that there was a need to continue and deepen deliberations on the applicability of International Law to cyberspace and set norms of responsible behaviour of States. The leaders welcomed the holding of the 5th Global Conference on Cyberspace in New Delhi on 23-24 November. The leaders noted that the bilateral Cyber Dialogue provided a strong foundation for existing and future cooperation and welcomed the holding of its latest round in New Delhi on 29 August this year, and the next India-EU Cyber Dialogue in Brussels in 2018. 10. The leaders strongly condemned the recent terrorist attacks in many parts of the world, underlining their common concern about the global threat posed by terrorism and extremism. They adopted a Joint Statement on Cooperation in Combating Terrorism with a view to deepening their strategic and security cooperation, and expressed their strong commitment to combat terrorism in all its forms and manifestations, based on a comprehensive approach. The leaders resolved to step up cooperation through regular bilateral consultations and in international fora. In this context, they welcomed the India-EU Dialogue on Counter-Terrorism on 30 August 2017 in New Delhi, and the joint commitment to explore opportunities to, inter alia, share information, best practices, including regarding countering the on-line threat of radicalisation, and to engage in capacity building activities, such as training and workshops. They also emphasised the need to deepen cooperation within the UN and the Financial Action Task Force (FATF). 11. The two sides reaffirmed their commitment to strengthening global non-proliferation efforts as highlighted at the India-EU Non-proliferation and Disarmament Dialogue in New Delhi on 18 July 2017. The EU congratulated India on its admission to the Missile Technology Control Regime (MTCR). The EU welcomed India’s subscription to The Hague Code of Conduct against Ballistic Missile Proliferation (HCoC) and noted India’s intensified engagement with the Nuclear Suppliers’ Group (NSG), the Wassenaar Arrangement and the Australia Group, which strengthens global non-proliferation efforts. 12. India and the EU reaffirmed their commitment to enhance maritime security cooperation in the Indian Ocean and beyond. Both sides noted the recent joint manoeuvres (PASSEX) between the EU Naval Force and the Indian Navy off the coast of Somalia, as a successful example of naval cooperation. The EU looks forward to India’s possible participation in escorting World Food Program vessels in the near future. They also underlined the importance of freedom of navigation, overflight and peaceful resolution of disputes, in accordance with the universally recognised principles of International Law, notably the United Nations Convention on the Law of the Sea (UNCLOS) 1982. Both leaders attached importance to the security, stability, connectivity and sustainable development of Oceans and Seas in the context of developing the “blue economy”. 13. Both sides agreed to enhance the India-EU space cooperation, including Earth observation. 14. India and the EU reiterated the importance they attach to human rights cooperation, including on gender equality and women empowerment in all spheres of life. In this regard, they looked forward to the next session of their dialogue to be held in New Delhi and supported enhancing interaction in international fora, in particular the UN General Assembly and the UN Human Rights Council. 15. The two sides expressed support to the Government and the people of Afghanistan in their efforts to achieve an Afghan-led and Afghan-owned national peace and reconciliation. The two sides remain determined to counter all forms of terrorism and violent extremism, considering them fundamental threats to international peace and stability. India and the EU underline the importance of the regional and key international stakeholders to respect, support and promote a political process and its outcome in order to ensure peace, security and prosperity in Afghanistan. The EU appreciated the positive role being played by India in extending development assistance in Afghanistan, including for building social and economic infrastructure, governance institutions and human resource development and capacity building. Both sides reconfirmed their commitment to promoting peace, security, and stability and supporting Afghanistan on its development path to become a self-reliable and prosperous state. 16. India and the EU expressed deep concern at the recent spate of violence in the Rakhine state of Myanmar that has resulted in the outflow of a large number of people from the state, many of whom have sought shelter in neighbouring Bangladesh. Both sides took note that this violence was triggered off by a series of attacks by Arakan Rohingya Salvation Army (ARSA) militants which led to loss of lives amongst the security forces as well as the civilian population. Both sides recognised the need for ending the violence and restoring normalcy in the Rakhine state without any delay. They urged the Myanmar authorities to implement the Kofi Annan-led Rakhine Advisory Commission’s recommendations and work with Bangladesh to enable the return of the displaced persons from all communities to Northern Rakhine State. India and the EU also recognised the role being played by Bangladesh in extending humanitarian assistance to the people in need. 17. India and the EU reaffirmed their support for the continued full implementation of the Joint Comprehensive Plan of Action (JCPOA) regarding the Iranian nuclear issue. They recognised confirmation by the International Atomic Energy Agency (IAEA) that Iran is complying with its nuclear-related JCPOA commitments. India and the EU called for the full and effective implementation of the deal, which has been endorsed by the UN Security Council and is a crucial contribution to the non-proliferation framework and international peace, stability and security. 18. Both sides condemned the nuclear test conducted by DPRK on 3 September 2017, which was another direct and unacceptable violation of the DPRK’s international commitments. They agreed that DPRK’s continued pursuit of nuclear and ballistic missile programmes and its proliferation links pose a grave threat to international peace and security, and called for the complete, verifiable, irreversible denuclearization of the Korean Peninsula, which has been endorsed by the UNSC and the Six Party Talks. Both sides stressed the responsibility of those who support DPRK’s nuclear and missile programmes. They also stressed the importance of unity of the international community in addressing this challenge, ensuring that all UNSC sanctions are fully implemented by the entire international community, so as to maximize pressure towards achieving a peaceful and comprehensive solution through dialogue. 19. Regarding the situation in Syria, India and the EU reaffirmed the primacy of the UN-led Geneva process and called for full support for the intra-Syrian talks with a view to promoting a political solution in Syria. Protection of civilians and territorial integrity is fundamental and all parties to the conflict and their supporters are expected to live up to their commitments. India and the EU reaffirmed that only a credible political solution, as defined in UNSCR 2254 and the 2012 Geneva Communiqué will ensure the stability of Syria and enable a decisive defeat of Da’esh and other UN-designated terrorist groups in Syria. India and the EU agreed that the second Brussels Conference on Syria in spring 2018 will contribute to sustain international commitment to Syria. 20. On the Middle East Peace Process, India and the EU reiterated calls on parties to engage constructively so that a just, lasting and comprehensive resolution of the Israeli-Palestinian conflict, based on the two-state solution, could be achieved on the basis of relevant United Nations resolutions, the Madrid Principles, the Arab Peace Initiative, for peace and stability in the Middle East. 21. The two sides also reiterated their full support to the UN facilitated Libyan-led and Libyan-owned political process to forge a lasting solution to the political crisis in Libya. Establishing an inclusive government and building peace and stability in Libya is in the interest of the entire international community. 22. India and the EU acknowledged the importance of connectivity in today’s globalised world. They underlined that connectivity initiatives must be based on universally recognised international norms, good governance, rule of law, openness, transparency and equality and must follow principles of financial responsibility, accountable debt financing practices, balanced ecological and environmental protection, preservation standards and social sustainability. 23. Both sides underlined the importance of ASEM as an informal platform for connecting Asia and Europe. Both sides also agreed to give new impetus to ASEM in the run up to the next ASEM Summit to be hosted in Brussels, where the focus would be on tackling global challenges together. 24. The leaders underlined their strong support for a diplomatic solution to the conflict in eastern Ukraine through the full implementation of the Minsk Agreements by all parties in accordance with UN Security Council Resolution 2202 (2015). 25. The EU hoped for a swift solution, through the due process of law in India, in the case of MV Seaman Guard Ohio, which concerns fourteen Estonian and six British citizens sentenced to prison by an Indian court. Global Challenges – Multilateral Cooperation. 26. Both sides reaffirmed their support to the new United Nations reform agenda on the three reform tracks of peace and security, development and management reform. The two sides’ commitment to stronger global governance also translates to reforming the bodies and organs of the UN system, including the comprehensive reform of the UN Security Council as well as the revitalisation of the work of the General Assembly, better aligning the work of its committees with the 2030 Agenda. 27. The two sides agreed to work bilaterally and with partners in the G20, the United Nations and other multilateral fora to address emerging challenges to international security, global economic stability and growth. 28. The leaders reaffirmed the crucial role of the rules-based multilateral trading system, and the importance of enhancing free, fair, and open trade for achieving sustainable growth and development. They reaffirmed their commitment to work together with all Members of the WTO to make the eleventh WTO Ministerial Conference a success with concrete results, which would reaffirm the centrality of the rules-based multilateral trading system and its importance for open and inclusive global trade. 29. Both sides recalled the adoption of the 2030 Agenda for Sustainable Development, the joint commitment to its implementation with the complementary new EU Consensus on Development and India’s “sab kasaath, sab kavikas” policy initiatives, and reaffirmed the importance of global partnerships to achieve the Sustainable Development Goals and poverty alleviation. In this regard, they reiterated their commitment to collaborate on common priorities and looked forward to exploring the continuation of the EU-India Development Dialogue. Both sides also recognised the need to mutually reinforce the Sendai Framework for Disaster Risk Reduction 2015-2030. 31. The EU leaders welcomed India’s efforts to promote economic and social development and expressed the EU’s continued interest in participating in India’s flagship initiatives such as “Make in India”, “Digital India”, “Skill India”, “Smart City”, “Clean India,” and “Start-Up India”. The EU closely follows Prime Minister Modi’s economic reforms, including the historic introduction of the Goods and Services Tax (GST), which can facilitate ease of doing business and promotes market integration in India by realising a simple, efficient and nation-wide indirect tax system. Prime Minister Modi appreciated the ongoing participation by EU companies in the flagship initiatives and called for their deeper engagement in India’s developmental priorities. The EU side encouraged the greater participation of Indian business organizations into the Enterprise Europe Network. The leaders noted the progress made on EU-India cooperation on resource efficiency and circular economy. Both sides agreed to enhanced cooperation and exchange of experience and best practices in the field of Intellectual Property rights (IPR) and public procurement. 32. The Leaders expressed their shared commitment to strengthening the Economic Partnership between India and the EU and noted the ongoing efforts of both sides to re-engage actively towards timely relaunching negotiations for a comprehensive and mutually beneficial India-EU Broad Based Trade and Investment Agreement (BTIA). a. Strengthening existing dialogues like Agricultural and Marine Working Group, SPS-TBT Working Group to cover issues on food safety and agricultural trade between the relevant Indian ministries/departments and relevant European Commission services. b. Initiating joint projects in areas such as good agricultural practices, development of traceability capacities, and cooperation in laboratory activities, including testing and monitoring. c. The EU would welcome India’s application for protection as a geographical indication of Basmati and shall process any such future application, as expeditiously as possible. d. India welcomes EU’s intention to expeditiously initiate the process of recognising additional seed varieties of Basmati rice under Article 28 of the GATTS 1994 for duty derogation, as already requested by India. 34. Leaders welcomed the establishment of an Investment Facilitation Mechanism (IFM) for EU investments in India as a means to improve the business climate and hoped that the IFM will ease sharing of best practices and innovative technology from the EU to India. Leaders acknowledged that the “Make in India” initiative may offer investment opportunities for companies based in the EU Member States. 35. Leaders welcomed the establishment of the South Asian Regional Representative Office of the European Investment Bank (EIB) in India and noted that its investments, especially in urban mobility and renewable energy projects, will support India-EU collaboration on the Climate Agenda. The leaders welcomed the new €500 million EIB loan agreement for Bangalore Metro Phase-II Project, which is part of EIBs enhanced commitment of €1.4 billion in loans to India in 2017. 36. The leaders noted the ongoing positive discussions and the exchange of a Joint Declaration between the Interim Secretariat of the International Solar Alliance (ISA), and the European Investment Bank (EIB) aimed at mobilising investments for broad-based deployment of affordable solar energy applications across the 121 prospective member countries of the ISA. 37. Both sides adopted a Joint Statement on Clean Energy and Climate Change, reaffirmed their commitments under the 2015 Paris Agreement, and agreed to co-operate further to enhance its implementation. India and the EU noted that addressing climate change and promoting secure, affordable and sustainable supplies of energy are key shared priorities and welcomed the progress on the Clean Energy and Climate Partnership, adopted at the 2016 EU-India Summit, and reiterated their commitment to its implementation and further development, in accordance with the work programme agreed at the EU-India Energy Panel meeting in October 2016. 38. India and the EU reaffirmed their commitment to undertake mutual cooperation for reducing the cost of development and deployment of renewable energy projects through technology innovation, knowledge sharing, capacity building, trade and investment, and project establishment. 39. The leaders reiterated the importance of reconciling economic growth and environment protection. They highlighted the importance of moving towards a more circular economic model that reduces primary resource consumption and enhanced the use of secondary raw materials. They welcomed the contribution of the International Resource Panel, the Indian Ministry of Environment, Forests and Climate Change (through the Indian Resource Panel) and of the National Institution for Transforming India (NITI Aayog) to developing strategies for this crucial economic transition. Both sides agreed that the newly established G20 Resource Efficiency Dialogue will be an ideal platform for knowledge exchange and to jointly promote resource efficiency at a global level. Leaders also agreed to further intensify cooperation on addressing environmental challenges, such as water management and air pollution, acknowledged the progress in implementing the India-EU Water Partnership, including an agreed action programme, the increased cooperation opportunities on research and innovation, looking forward to the third India-EU Water Forum later in the month. 40. The leaders agreed to work towards an enhanced cooperation on innovation and technology development aiming at actions strengthening cooperation between European and Indian industries and start-up ecosystems. 42. Both sides noted positive exchanges on Internet Governance, on increasing the ease of doing business for ICT companies on both sides, as well as meetings between the Indian and European start-up ecosystems under a “Start-up Europe India Network”. 43. The two sides confirmed their interest in further strengthening the cooperation in the area of pharmaceuticals, including capacity building of the regulatory system with particular focus on inspections by creating a more structured and stable training environment. The Indian side also highlighted its interest for cooperation on capacity building of the entire pharmaceutical value chain. 44. The leaders adopted the India-EU Joint Statement on a Partnership for Smart and Sustainable Urbanisation with a view to step up cooperation including with regard to priority sectors such as the upgrading of urban infrastructure for transport and sanitation, developing Smart Cities in India, as well as promoting the New Urban Agenda of the United Nations adopted in 2016. 45. The leaders agreed to scale-up cooperation under the renewed India-EU Science and Technology Cooperation Agreement in frontier areas of science and technology and in addressing current global challenges in particular in the areas of health, water and clean energy. They welcomed the agreement to launch a major joint flagship initiative of €30 million on water-related challenges reflecting the pressing need to cooperate on technological and scientific knowledge and management capacities to cope with increasing stress on water resources. Both sides agreed to work towards reciprocal opening of the EU Framework Programme for Research and Innovation ‘Horizon 2020’ and Indian programmes, and called for an intensified two-way mobility of researchers. To this extent, the two sides welcomed the conclusion of the Implementing Arrangement between the Science & Engineering Research Board (SERB) and the European Research Council (ERC). 46. The leaders encouraged Euratom and the Department of Atomic Energy to conclude the Agreement for Research & Development Cooperation in the field of the Peaceful Uses of Nuclear Energy. They stressed that this cooperation will contribute to further enhancement of nuclear safety and will be mutually advantageous. The cooperation will also lead to improving the skills and deployment of non-power technologies in the areas of water, health care & medicine, environment, etc., for the benefit of the society. 47. Both sides will continue their strong partnership in the development of fusion energy, building on the agreements to which they are parties, including under the Euratom-India Cooperation Agreement on Fusion Energy research. 48. The Leaders welcomed the imminent operationalisation of the 2008 Horizontal Civil Aviation Agreement, which will enhance air connectivity between India and Europe and help foster greater people-to-people contacts, business travel and increase in tourism. The leaders considered the opportunity to deepen transport cooperation in areas of mutual interest across all modes of transport, notably maritime, aviation, urban mobility and, rail. 49. India and the EU agreed to intensify cooperation in skills development and agreed to find complementarities and synergies between India’s Skill India initiative and the EU’s New Skills Agenda for Europe. 50. The leaders emphasised that, as part of the India-EU Agenda for Action 2020, there was a need to work towards strengthening cooperation on higher-education, including through India’s GIAN programme and the EU’s Erasmus+ programme. The Erasmus+ programme has just celebrated its 5000th Indian alumni and has offered financing opportunities for institutional cooperation to many Indian universities through joint-masters, short-term mobility, capacity building projects and Jean Monnet actions for EU studies. The leaders welcomed that, overall, India has been the number one beneficiary of Erasmus mobility actions in the world since its creation. 51. The two sides took note of the High Level Dialogue on Migration and Mobility held in Brussels on 04 April 2017. They welcomed the understanding reached in advancing the Common Agenda on Migration and Mobility, including through technical collaboration and undertaking projects in areas of mutual interest, with a view to better organising migration and mobility between India and the EU. 52. The leaders agreed to intensify people-to-people exchanges and facilitate increased travel of tourists, business persons, students and researchers between India and the EU. The Indian side noted the ongoing revision of the EU Blue Card Scheme aimed at easing the flow of highly qualified professionals to the EU. 53. The leaders noted the adoption of the report on “EU’s Political Relations with India” in the European Parliament and welcomed its recommendations for intensifying the exchanges between the Indian and European parliamentary delegations. The leaders also looked forward to intensified exchanges between scholars, think tanks and cultural delegations.